The Arroll Victorian 9 Radiator is perfect for under windows and also makes a nice warm seat. 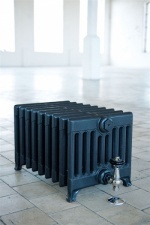 Period House Store are nationwide distributors of Arroll Cast Iron Radiators, we like to keep our prices as competitive as possible but we offer a price match guarantee, where you will get the best prices in the marketplace and benefit from Period House Stores knowledge and customer service. We distribute Arroll Cast Iron Radiators worldwide, for overseas deliveries please contact us for shipping quotes.